Changelog - Version 18.6 is fully compatible with all versions of Acronis 2019. It is backward compatible with Acronis 2018, 2017 and the most current version of 2016. It is also fully compatible with all publicly released versions of Windows Operating System 10, 8.1, 8 and 7. It also supports the incorporation of multiple Acronis products into the same WinPE media (True Image, Universal Restore, Disk Director, Acronis Revive, Snap Deploy and Backup)! Due to the larger size of the Advanced version, (about 140Mb), we are unable to post it directly in the forums so everything has been moved to the Acronis MVP Google Drive. Basic is no longer supported and considered deprecated since the release of Acronis True Image Home 2018. Please use the advanced mode; trust us, you’ll like it and it's every bit as easy to use. Advanced - just as easy to use to build your WinPE rescue media as the old Basic version! It does everything that Basic did, but also includes options for Bitlocker support, ISCSI support, a web browser, file explorer, explorer shell, 7zip association, PDF association, custom tools, screen resizing and more! As of 18.2 (and newer), additional Acronis products can be added to the same WinPE rescue media if they are already installed on the system where the media is being created (True Image, Universal Restore, Disk Director, Acronis Revive, Snap Deploy and Backup). MVP ATIPEBuilder is essentially a batch script tool designed by MVP's: Bobbo_3C0X1 and Mustang, with collaboration from Steve Smith and Enchantech and testing by other MVP's. This tool can be run on any 32-bit or 64-bit system that is using Windows Operating System 7, 8, 8.1 or 10, as longs as there are compatible versions of Acronis products already installed on it. This tool does NOT work with legacy versions of Acronis True Image Home (Early versions of 2016 and earlier) and there are no MVP plans to provide support for them, due to variations in the Acronis provided WinPE content. Additionally, newer Acronis products are designed to have better compatibility with newer hardware technologies and current Operating Systems and we believe that using more current versions of Acronis products is beneficial for users looking to migrate to these newer technologies. Anyone with a Windows 7, or newer, Windows OS and has a current version of a supported Acronis product, may use this tool to build CUSTOM 32-bit or 64-bit Acronis Bootable Rescue Media. This will be especially useful for those of you that have 32-bit only UEFI systems or the OEM manufacturer has set the SATA mode to RAID in the BIOS and it cannot be changed. This tool also supports automatic driver injection in both the 32-bit and 64-bit media creation process, with support already embedded for the latest PCIE NVME hard drives and Intel Rapid Storage Technology (IRST). Whether using this tool to build 32-bit or 64-bit customized WinPE Acronis Bootable Rescue Media, the resulting media can also be booted in legacy mode for ANY system (32-bit or 64-bit), where the bios supports legacy/CSM booting and/or UEFI mode for ANY system where the bios supports UEFI booting. 01) Prior to the release of Acronis True Image Home 2018, the default version of the Acronis Bootable Rescue Media was based on Linux and typically did not have RAID controller drivers such as Intel Rapid Storage Technology (IRST), which are needed to detect newer hard drives when the SATA mode in the bios has been set to RAID by the manufacturer. Although Acronis True Image Home 2018 (and newer) has options to build rescue media with WinPE or WinRE, and also includes driver injection now, it still has some limitations compared to this tool. 02) Driver injection is now built into the MVP tool and additional drivers can seamlessly be added "on-the-fly". By default, we already provide the latest Intel Rapid Storage Technology (IRST) drivers (if you choose to run the driver injection option) so that anyone using the latest NVME PCIE hard drives can create media that will support it out of the box - even if the manufacturer has set the SATA mode to RAID in the bios. (Note: if your system has a custom RAID controller such as LSI or Rocket-RAID, you may still need to add those drivers into the driver folder before running the tool). What we've done with this tool is simply emulated the Acronis default media builder process, but enhanced it. We take full advantage of the provided 32-bit and 64-bit WinPE tools that Acronis provides. We have added a section for CUSTOM / AUTOMATIC driver injection too! The entire process is handled with Microsoft DISM commands from the WinPE ADK packages so that we can include the ability to add custom drivers, copy drivers from the local system into the build, include Bitlocker support, ISCSI support and native OS language support. Furthermore, instead of limiting the WinPE media to just True Image, it will search the system for all installed Acronis products such as True Image, Universal Restore, Acronis Revive, Snap Deploy, Backup, and include them in the recovery media. 01) This is not an official Acronis tool, but they like it a lot and have been supporting development. It has even been integrated into the application for easy access. However, we recommend checking the MVP Google Drive to ensure you are getting the latest version. We've tested it thoroughly and feel that it is not only useful, but safe to use. If you do have issues, please be sure to post here in the forums for assistance. 02) The tool should always be run with Administrative Privileges to ensure that the script has the proper access for making changes where necessary. We've taken precautions to ensure that the script is always run with admin access (even if you forget). All current advanced versions are now an EXE that forces admin access before launching. However, please still try to always right-click and "run as administrator" whenever possible - just to be sure though. 03) On some machines, the tool may flag as an untrusted file under Windows Smart Screen or may even flag as malware. Working with Acronis, we are now releasing "signed" versions of the tool to alleviate this issue (18.4 and newer), but different antivirus programs may behave differently. This tool is not malicious and contains no malware. You can safely run it without fear, but please do so only if you are comfortable doing so. Rob, thanks for all the work put into this tool. I have successfully tested the tool on both my 32-bit and 64-bit laptops today, the former with Windows 7, the latter with Windows 10, both with ATIH 2017. Thanks Steve, appreciate the feedback and help polishing it up. Hopefully it will be posted as a sticky in the near future. New MVP ATI PEBuilder tool has been released!!! This is an updated version which now supports both 32-bit or 64-bit custom WinPE builds in Acronis and allows for automated driver injection! IRST drivers are included by default (if you run the driver injection when prompted). Due to larger size, (about 50Mb), we are unable to post it directly in the forums so it is available from the Acronis MVP Google Drive. Now includes automated DRIVER injection for custom 32-bit OR 64-bit WinPE builds, a web browser, file explorer and more !!!! Both versions include automated DRIVER injection for custom 32-bit OR 64-bit WinPE builds. Advanced version also includes , a web browser, file explorer and more !!!! Just a short note to say thank you for this - the standard bootable media (created by ATI 2017 build 5554) both standard and WinPE would not detect my NVME (samsung 960 pro) in a Dell E5570 laptop. This custom build with the IRST drivers (i didn't add any custom ones) allowed the nvme ssd to be correctly detected and i could clone to the new disk. So thanks - this saved me a lot of time, effort and headaches! Does everything that Basic does and also includes Bitlocker support, ISCSI support, a web browser, file explorer, shell, 7zip association, PDF associations, tools, customizations and more. So glad to hear it! That's why we developed it. Just wanted a nice, simple way to build WinPE. It's something we'll keep plugging away to keep making better too (I'd like to include the winpe files necessary to build so we don't have to download and install the full ADK - very possible, but need to make sure that would be OK first). Better launchbar icons (fixed a bug where the True Image icon was "generic" when built with 2016 versions, updated explorer++ icon), cleaner script for source variables, brought back irfanview in addition to the default pdf viewer (Sumatra) per request. Rob, a word of thanks for including IrfanView again with the MVP customer ATI WinPE Builder - this has the added benefit of allowing screen captures to be made when using the offline Windows boot media, which otherwise would require using a digital camera. I tested this earlier today making both the 32-bit and 64-bit Rescue Media and performed an entire disk recovery (to recreate a recent forum topic issue). See attached PDF document showing the steps required for this with screen shots captured doing this. Glad to hear it. I didn't realize that irFanview could take screenshots and that's the main reason it was put back in. The more useful we can make the tool, the better! I am late about to notice this marble but kudos Rob for doing this. I think there are not many systems that will use UEFI and 32bit, as Microsoft say it is supported for 64bit OS only, but you'll never know. I think I will give it a try. Just in case anyone needs a comprehensive site for downloading Intel RST drivers, here it is. Don't hesistate to use it because it is german, the drivers are universal / multilanguage. If none of these apply for you, I can share RST drivers via a cloud drive. Please note that you cannot simply use the latest Intel RST for all Intel Chipsets. Quite unfortunately there are some restrictions and the latest package 15.x is applyable to older chipsets. It is a matter of try and error to find the latest applyable RST for your Intel Chipset. Additionally when trying to install the driver packages outside the driver injection, the setup may fail because Intel does make an error on checking the .net Framework version that is a prerequisite for the SetupRST (not the injection inf based drivers). The setup does check for a present version that has a specific version instead checking the fact that a minimum version of .net or higher is installed. if anyone is willing to find a solution for this .net installer error or report it to Intel, I would be glad to learn about that. Thanks for the links to the IRST driver versions. For those that have issues issues, they can always grab an older version (using your newly provided links, perhaps) to another one instead, or consider exporting their own local drivers, or grabbing them from the manufacturer. Intel® Rapid Storage Technology (Intel® RST) supports the following Intel® Chipsets. Note The product name was changed from Intel® Matrix Storage Manager to Intel® Rapid Storage Technology (Intel® RST) beginning with version 9.5. That's true Rob, but the setup based tool of RST are being unnecessarily picky, also because telling the user being not compatible (.net related or hardware related). As said this does not affect the inf based drivers, just the RST setup that would install / update drivers aswell. We may be talking about different things here, I suppose. However, yes, if they are having problems installing the full IRST suite on their local system using the executable (setuprst.exe or possibly even Intel Storage Matrix Manager) , they'll need to find a compabitle version to install on their machince. Neither of these are required to inject the IRST drivers into the WinPE though. Before installing this application or requesting technical support from Intel, first contact your system manufacturer. They typically provide software which is specifically configured for your system. Installs the Intel® Rapid Storage Technology (RAID) driver version 12.5.0.1066. Yes you are completely right, the SetupRST is unrelated to the injection. Good deal - was thinking that was the issue you were seeing, but glad to clarify. The only advantage to having Intel Stoarge Manager software installed in Windows is that it provides a GUI for management of a RAID array and it will allow enabling of the Write Back Cache for the installed drivers. After initial configuration using the Storage Manager it can be uninstalled and everything will work as intended. This may be desirable as the Storage Manager does delay Windows startup and consumes system resources when installed. True but is not necessary to have installed. Once used to install drivers etc. it can be removed if desired. Guys, I have created a WinPE with ATIH 2017 and cannot boot from that. In legacy mode it says MBR error. In UEFI it is not showing up as bootable stick at all. What I am doing wrong. Used ATIH 2017 b6654, Windows 10 ADK for Anniversary Update. Karl, have you tried doing a full format of the USB drive and then creating the media again? Quickformat, FAT32 isn't that enough? Hi Karl, there have been a number of reports, including from MVP's where the quickformat just doesn't do the job and a full format of the USB drive was needed. Formatting of USB Sticks has always been problematic, particularly if you use quick format rather than full format. The is a stand-alone tool developed by HP which is highly recommended for formatting USB sticks. Hi Karl, I agree with Steve. I believe you had another recent post with the default media builder where it was unbootable as well and after doing a full format it was working again - no? If you have a working bootable Acornis Flash drive, chances are you don't need to do a full format, but if you're using a flash drive that was created with another purpose or formatted with a tool like rufus, I'd recommend a full (non-quick) format before creating the media as well. A quick format will not format the hidden system volume partions and does not check for system integrityh issues, but a full format will handle both and thus should result in a bootable drive when you recreate the media after doing the full format. The best tool I have found for doing this is RMPrepUSB tool. Cleans all existing formatting and preps the drive as FAT32 in about the same time or less than a quick format. Thanks Bob! May I expect that doing a diskpart > cleanup and quickformat does the same? I would suspect so although I have not tried that. The RMPrep tool runs inside a command prompt to prepare a flash drive. It shows you what it is doing but it is fairly quick. I have tried to take note of what the process is exactly but I cannot quote it here. What I can say is that the settings allow for complete control over preparing a flash drive and even installing a boot manager. The default is set as WinPE boot manager and allows for FAT 16, FAT32, NTFS, and exFAT filesystem use. You can also add a path to OS system files if desired. Thanks again for your help offered. I have found the culprit why the WinPE was not booting. There are two different ADKs (or more) for Windows 10. It is jolly hard because both files have the same filename (adksetup) and there will be no error on installing the 1511 ADK on a 1607 Windows. Also Acronis does not come up with an issue upon creation. 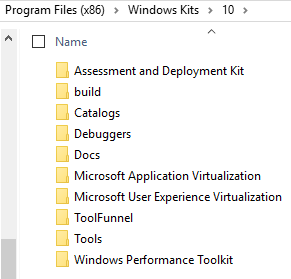 Now that I have checked programs and features I got aware that I have installed the wrong ADK for my particular Windows that is based on build 1607, so I had to uninstall the 1511 ADK and install the 1607 ADK again. This step ultimately solved the issue that the Acronis WinPE did not boot as UEFI / legacy at all. Interesting! I am using build 1607 OS but 1511 ADK and it boots fine for me. However, I have learned that when changing ADK, it is best to completely remove the original and then go back and delete the leftover ADK folders in C:\Program Files (x86)\Windows Kits\10. I even then run CCleaner and reboot before installing ADK again. I don't think the upgrades go so well. Ultimately, best to have the matching ADK for your OS though! I have kept 1511 as Snap Deploy still is not compatible with the 1607 ADK yet. Thanks from another user whom was able to create a WinPE bootaable USB Flash Drive by using this tool. - the standard bootable media (created by ATI 2017 build 5554) both standard and WinPE would not detect my NVME SAMSUNG MZVLV256 in a Lenovo Yoga 910 laptop. This custom build with the IRST drivers (i didn't add any custom ones) allowed the nvme ssd to be correctly detected so I am able to restore my computer to a previous image. Thanks for the great feedback Mark. We have plans to make it even better in the near future, but the current process of the MVP tool still works very well and is now my default method for creating Acronis bootable recovery media as I feel it just makes adding drivers so much easier and the inclusion of the IRST drivers by default is usally where most people would falter since the Acronis default media builder does not have a driver injection process (at least not currently). Thanks for creating this useful tool. I was able to create a bootable USB flash drive with no problems. I built using the latest advanced version 7.3. I appreciate having the browser, file manager and networking built in. I have one machine that connects wirelessly to the net. It would be nice to have a wireless network connection but I can certainly live with out it. We've played around with trying to add wireless to the WinPE. Unforunately, Microsoft ADK (winpe.wim) does not include wireless components on purpose as they attempt to leave it as minimal as possible so that users don't attempt to use it like a full blown OS. It is possible to add them using winre.wim (check out MustangPE which can do this, but you have to supply the winre.wim file). Getting the local system recovery file from the hidden parition is pretty tricky (especially if there is an OEM recovery parition and a Windows recoveyr parition) and requires modifying system permissions and ownership to get to it. As a result we've opted to leave it alone as we don't want to cause any unforseen ill-will to the local system. If something else comes along, we will try to adapt it. Down the road, we may add an option for the user to put their system winre.wim in a folder and if it exists, then that can be used instead of the default ADK winpe.wim, but we'll have to kick the idea around. Thank you very much for this tool! I don't personally need it for the 32 bit UEFI support, but there have been times when I really wished the recovery tool had a browser, file explorer, etc. Inclusion of the browser, file explorer, and PENetwork manager. Another thing: my first attempt at creating the tool resultedd in a nonbootable USB flash memory stick. Actually, more than nonbootable; BIOS did not even see the device. (I didn't try a UEFI boot.) My second attempt at creating the tool was successful. The only thing I know I did wrong the first time was saying I wanted to inject drivers. Your message " IRST drivers are already available. " didn't show up until I had picked driver injection and I had no drivers to put in Drivers\x64 folder. Everything else went normally. Could that have messed up the creation process? Patrick, there are known issues with creating USB media if this has not been fully formatted previously as a search in the forum will show. Some MVP's will recommend various specific tools to do the format, others suggest using Diskpart to do the preparation, but doing a full format (as opposed to Quick Format) should also work fine. Reusing a USB drive that has been bootable previously also tends to work. I will leave others to respond to the NAS public share question - this too has been raised previously in the forum where Acronis appears to not play well with shares that don't need credentials. I have no public shares on my NAS so am not in a position to try testing this issue - I don't even have any Windows shares to the NAS, preferring to keep it exclusively for use by various applications, including ATIH, using dedicated NAS credentials that do not match any Windows user credentials. Thanks Mark. Using your info, that's exactly what someone who would want to go this route should do, but I think we'll leave it up to them to grab it themselves. We're a leery to modify the folder permissions - even though we can set them back as well, just don't want to bugger things up on accident and leave someone's recovery parition messed up. It's definitely doable to get it from the system, an MS installer .iso or flash drive, etc. The main issue for the script would be how to automate the process so that it would do all that automatically and safely. The recovery parition may be in different locations on the drive or may actually have different/multiple ones and automating the process can get hairy since it's not consistent across machines. I just downloaded and ran the MVP WinPE Builder...It worked flawlessly. Excellent work. Edit...Mustang thanks for the great work! Thanks a million for all the work, effort and superb documentation. I've been away and completely missed opportunity to create WinPE earlier. I actually purchased a Dell XPS 15 during the Black Friday ( Friday after ThanksGiving ) to test and experiment with all this software; however, got so busy, I just didn't get chance to even open the XPS 15 box. I shipped it back in Jan 12 using extended holiday return period. I'm sort of glad I didn't do anything back then as several things have transpired. There are no words that can express, explain nor describe thanks and gratitude to you Bobbo specifically and others who have assisted in this effort. Is the external Google drive your creation? Correct me if i'm wrong, but there isn't a way to clone directly to an external NVMe of the same type, then swap it with the internal? One has to create and save a clone image of the drive to external source, then instert new drive in system, then clone external image to internal new drive, correct? As for nvme drives... unfortunately, I am not aware of any external adapters for them. You can get m.2 SATA to USB adapters, but I haven't found any for m.2 nvme pcie to USB. There was one on Amazon and eBay, but it is really only for m.2 SATA too. So, a clone is only possible if you have multiple internal connectors or a pc that has some pcie slots that would require a pcie nvme adapter. 2. Take a disk backup image to an external drive, swap nvme drives and restore the image to the new one. This is the route I would go. Is there way to test it's the latest version? At the risk of going way-off topic. You can get USB 3/3.1 to PCIe 16 adapters (you can get them on eBay and probably Amazon), then you could plug in a PCIe to M.2 adater .... not very elegant and not sure if M.2 adapters support NVMe as well as SATA. 9.6 Advanced is released - entirely new build process - give it a whirl and let us know what you think - now that the retooling is complete, we hope to be able to provide additional updates as needed on a more regular basis. Another outstanding job by the MVPs'. The MVP WinPE Builder tool v9.6 works great. I need to test it on my desktop, but my laptop worked well.